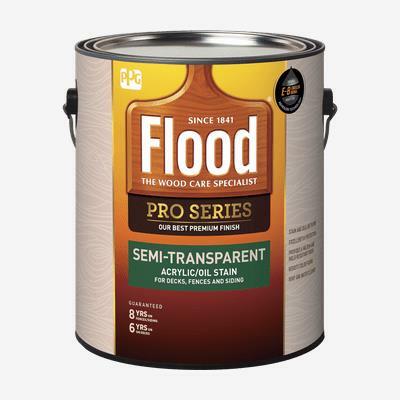 FLOOD® PRO Semi-Transparent Acrylic/Oil Stain (250 VOC) protects wood from moisture and sun damage while adding a rich, beautiful color that enhances the wood grain. It features E-B EMULSA BOND® adhesion technology and is recommended for use on any properly prepared exterior wood, including decks, fences, siding, railings, outdoor furniture and other wood surfaces. Apply to new, dry, pressure-treated wood, uncoated new or weathered wood, or previously coated wood with a weathered, clear sealant or semi-transparent stain.